As you guys know I have a serious sweet tooth. Since I've been on this weight loss journey. I've cut back so much on my sugar intake. Since, I reached my weight loss goal. I've tried to merge healthier alternatives to some of my favorite sweets. I've never had an authentic crêpe. However, I've tried making them at home and they're so yummy! I played around with a couple of recipes and ended up creating one that better suites my sweet buds. I love that this is a healthier alternative and it doesn't need the use of flour which I've tried to stay away from since April. I make my own oats flour at home which doesn't require much time to make and is great for my baking needs. I've even made pancakes, chocolate breakfast cake and flourless zucchini bread with my oats flour and it taste divine. Prior to this weight loss journey. I would not have ever guessed how I could still have my favorites at home guilt free. I made the crepes with a coconut whipped cream which was super easy to make and was so yummy as well. I plan on sharing that recipe on the blog soon so stay tuned. 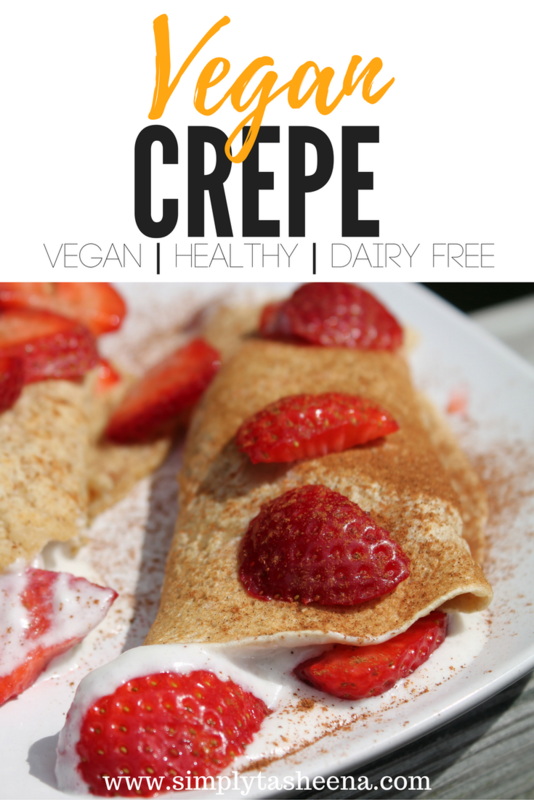 Are you a fan of crepes? I do love a good crepe, I never thought you could do it without the egg! My kids would love this, you can fill it with anything! Yes to everything in this! Crepes are one of my all time favorite foods. I love that you used oat flour. I need to try this recipe! Saving this recipe, I love crepe but I never tried making this at home yet. This is perfect for weekend breakfast for us. Wow, they look fantastic! I can't wait for your coconut whipped cream recipe. This looks delightful! We have friends and family who are vegan and this would be perfect for when they visit!